CIC Officer and musician, 2Lt the reverend Gordon Barrett is a distinguished University of British Columbia alumnus who has touched countless lives in his 40 years of public and community service. He began his education at UBC in 1978, earning a bachelor’s degree from the Faculty of Education. Twenty years later, he returned to earn a Master of Arts in 1998 and a Master of Education in 2000. He also holds a MDiv degree at Carey Theological College. 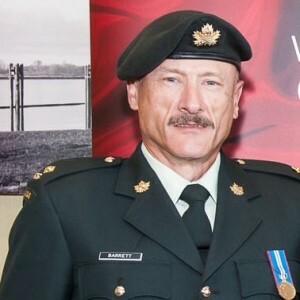 For over 30 years, Barrett volunteered for the Canadian Armed Forces as a musician, band administrator, and association chaplain. He served as pipe major, honorary captain and regimental director of music with the British Columbia Regiment Irish Pipes & Drums. As an ordained Anglican deacon and honorary captain with the 15th Field Regiment, Royal Canadian Artillery he worked with the Military Family Resource Centre, where he assisted soldiers and their families in the lead-up to deployment and through their reintegration into society. His service extended to working with families of soldiers who were seriously injured or killed. Barrett is the padre and event emcee for the Korean War Veterans Association of Canada, pastor for North Shore Search and Rescue and an officer with 2472 15th Field RCACC. He is a deacon at All Saint’s Church in Burnaby, B.C., Diocese of New Westminster. For his lifetime of service, Barrett’s distinguished honours include the Queen’s Golden Jubilee Medal in 2002, the British Columbia Regiment Medal in 2002, the British Columbia Community Achievement Award in 2008 and the Minister of Veteran Affairs Commendation in 2014 in recognition of his lifelong service to the veteran community.